These are desperate times. Last week I came down with a very sore throat, which I have been battling with my sore throat protocol. More recently it has migrated into a hacking cough and slightly runny nose. Ugh, I HATE being sick! I am in the grumpy complaining stage. So I made some garlic soup! Garlic is well known for its anti-viral (and anti-vampire) effects. In the last few days I have been mincing it, and swallowing it in a spoon of honey. But this garlic and onion soup is much tastier, and I can sip it through the day. It is warming and soothing and flavorful. The directions are all about a sick person can manage: First dice a large onion and saute it in a little olive oil in a big soup pot. Meanwhile smash and slice a whole head of garlic (and NO, that is not too much!) and add it to the pot. Inhale the pungent aromas! (Even if it makes you cough. The whole idea is to crush the cough with garlic!) Then add a liter of organic chicken broth, and a can of diced tomatoes with its juice. Salt and pepper to taste. Do your magic, garlic soup! Here's another anti-cough trick I learned about on the internet. To make a cough subside, try rubbing Vick's Vapo Rub on the bottoms of your feet! Then wear socks so you don't get it on your bedsheets or elsewhere. I tried it, even though it sounded like an Old Wive's Tale. Sure and begorrah, it worked! Not forever, but long enough for me to settle down and rest. I will continue to experiment with tha trick as long as this cough bedevils me. I don't care if I reek of garlic for a few days. I really hate this virus! You have been warned. 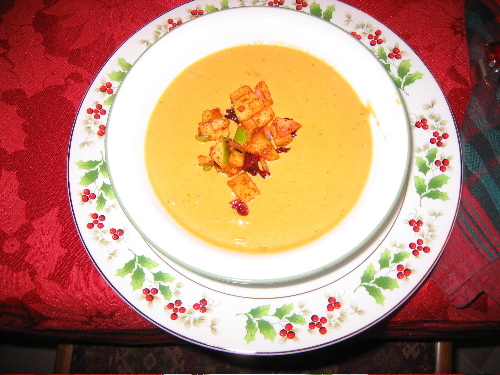 Pumpkin Soup with Chili Cran-Apple Relish is a recipe from Rachel Ray that was featured on the Food Network Thanksgiving special last year. No, I am not decorating for Christmas yet--the photo above was taken last December when I first made this dish. I absolutely loved this soup! Rachel's recipe is deceptively simple, but the real stunner is the savory, spicy and sweet relish that she uses as a garnish, and which elevates an otherwise unremarkable soup to a holiday favorite. The base of the soup is a traditional blend of stock, pumpkin puree, cream, herbs and spices, and vegetables such as celery and onion. There is heat in the form of hot suace to taste. The garnish consists of a small dice of onion, tart green apples such as Granny Smith, and dried cranberries, tossed with cinnamon, chili and honey. The way this chutney style garnish played off the creamy, mellow richness of the pumpkin was spectacularly delicious and tastes like the entire autumn and winter holiday season in a bowl. This is only one of a few great recipes from Rachel Ray that are in my keeper file. I hope you'll try it!